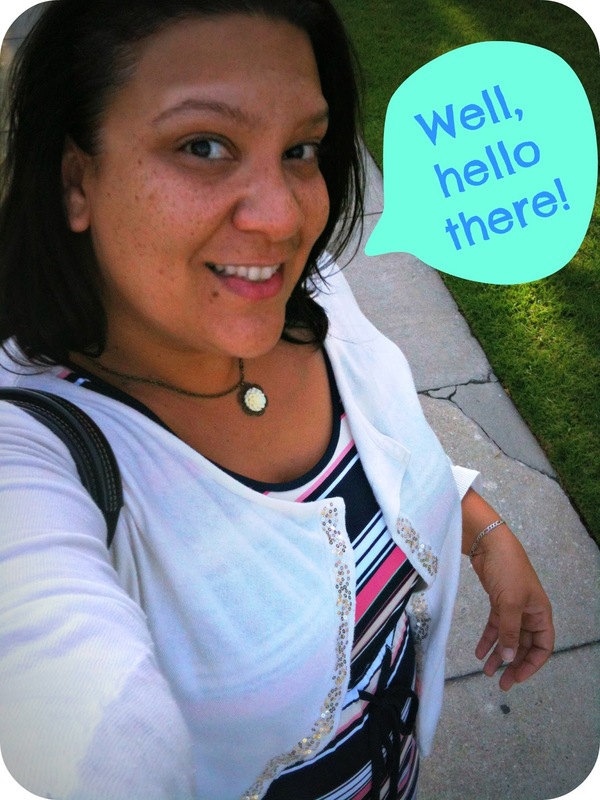 I just finished fixing that pic up there on picmonkey, ready to write a post, and guess what? No idea what to write you or chit-chat about. I really just wanted to show you my cute outfit that I wore on Monday. I wanted to tell you that this is what I really look like at the end of the day. After a long workday, in between the time I get picked up at work by the Husband and going to class...this is what I look like. I'm a little pooped but happy. I'm happy to have my phone in my hand, in the sunshine, walking to the convenient little corner where my husband picks me up, and thinking, "oh, I should take a pic right now...maybe it'll be a cute shot for the blog or instagram." And...looking around to make sure no one sees me taking a selfie. Being a blogger is pretty funny sometimes, right? I notice things that normal people don't, I think. I look at things differently wondering how I can put a spin on it and write about it on here. I am constantly thinking about the next blog post. You know what? It's not even to figure out what to write about or what will make someone come over here and stick around. It's just the excitement of writing...putting words to this screen in front of me and sharing them with people who will read them. It's my personal little adrenalin rush. I wish I had learned about blog-writing earlier. I have had all these words in my head, so much to say, and the need to share. Share, share, and share a little more. 'Cause Sharing is Caring as the Care Bears would say. I want to share every thought that goes on in my little ole head and tell you everything. The thoughts are many but my fingers can't type fast enough. Yes, I am noticing that I'm just hurling words at you on this so-called post. But I got to thinking...and really believing something. I have to stop caring if I have one reader, one comment, or hundreds of pageviews and readers. This blog post is mine. If you want to stick around, you will. If you don't because I've bored you or you have better blogs to read, that's okay, too. All that matters to me is that this blog is read and touches one person. behind the screen I'm typing on is a person (or maybe a few) that enjoy reading my blog posts. Out there is you, my lovey. And, wow....how awesome is that? That is the ultimate gift to a writer....to be read. I'm happy you are here, loveys. You make this place what it was meant to be from the get-go. A blog to be read by those few and far between...but read. Thanks for taking the time to come by, sit a little bit, and just be with me. Loved this post! I've started taking my camera everywhere with me, and sometimes I catch myself surveying the field to make sure no one is watching me take pictures of my food at the restaurant with my fancy camera. But I'm always thinking, hey that would be a cool picture then I can blog about this randomness. I've decided to stop worrying about readers, pageviews, comments, etc. I don't really care to work with tons of brands anymore, so it's not like it matters much. Now I'm just enjoying documenting our everyday life so that my kids can see all the cool, and not-so cool, things we did when they were kids. Finally I get to read your post today. I've been pushed and pulled today but when I finally sit down after getting home from a set-back kind of day, sure as heck you cheer me up! I love the title I wish I had thought of that lol I for one won't miss this here read of the day. I am here to stay! Loves you! I'm happy to be here. Because I love you in all of your glory, Miss Nay =).